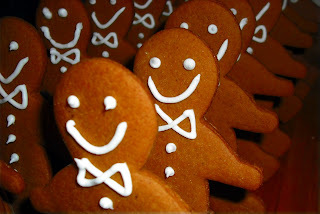 What is it about gingerbread and the human psyche? We just can't seem to get enough of it. Right down to the ever popular Starbucks offering of the Gingerbread Latte or Gingerbread Cocoa to Demeter's Gingerbread Cologne and Philosophy's Gingerbread Shampoo. Heck, William-Sonoma even offers a Gingerbread Butter and Paws n Claws offers a Gingerbread cologne for dogs. It just seems to be one of those universal comforting foods. I am just as much a slave to the aroma of fresh baked Gingerbread as anyone else. Which is WHY I love this time of year so much. Not only do I get to make massive quantities of Gingerbread Men (and Women) to satisfy my immediate need for all things gingerbread, but it's the time of year that I get to embark upon construction of that classic tempter of Hansel & Gretel, the Lebkuchenhaeusle or Gingerbread House. I use the same dough for both applications with only 1 major difference. For the dough destined to become Houses, I use Crisco due to it's lack of water, for it yields a drier, crisper construction material. When it comes to the dough that wont be sitting around on a shelf for 3 weeks and will DEFINITELY be consumed by myself and various other holiday visitors, I use Unsalted Butter, not only for the flavor that it imparts, but it also yields a slightly softer cookie. In the bowl of an electric mixer, begin creaming the Sugar and Butter(crisco) together until light and fluffy. Meanwhile, in a medium bowl, whisk AP Flour, Baking Soda, Kosher Salt, Ginger, Cinnamon and Cloves together and set aside. Add the egg to the butter/sugar mixer and mix well. Pour in Molasses and blend till homogeneous. Add Vinegar and blend well. Begin adding the flour mixture 3/4 cup at a time with the mixer on LOW speed to prevent a plume of wheat dust. Place in a bowl, cover and chill for at least 3 hours before attempting to roll. Form each portion into a flattened square, wrap with plastic wrap and chill over night. I'm excited to see you make a gingerbread house. Mmmm, gingerbread. I'm a gingerbread fan as well. Looking forward to seeing your creations.